Lists all archived files like documents, images, presentations, etc. Compatible with all storage device like SD card, Pen drive, etc. 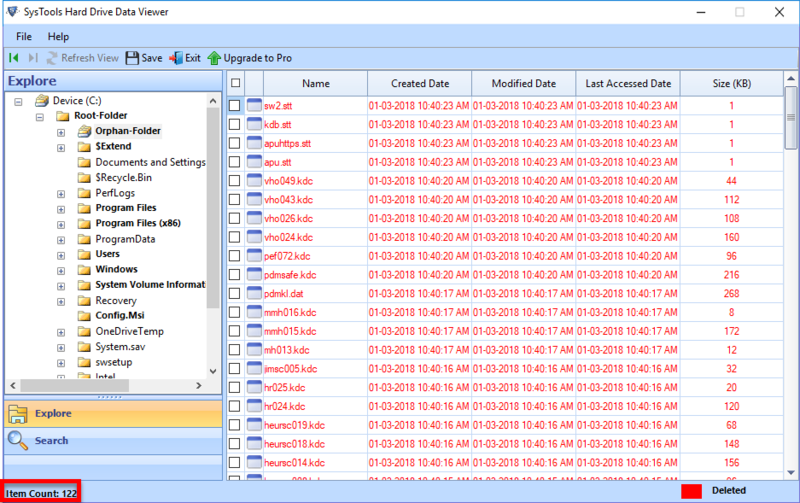 The hard drive data viewer opens items from hard drive and loads them on preview pane. It extracts all the data like images, audios, videos, documents, power point presentations, etc., from the hard disk. This software displays the data in same way as it originally existed. The tool is capable of extracting files from NTFS formatted hard drives. It supports the disk of any size without notifying any error while processing. When the software is completely done with data extraction, all the folders and files gets listed on the preview screen. Hard deleted files are those files which are permanently deleted from the system. 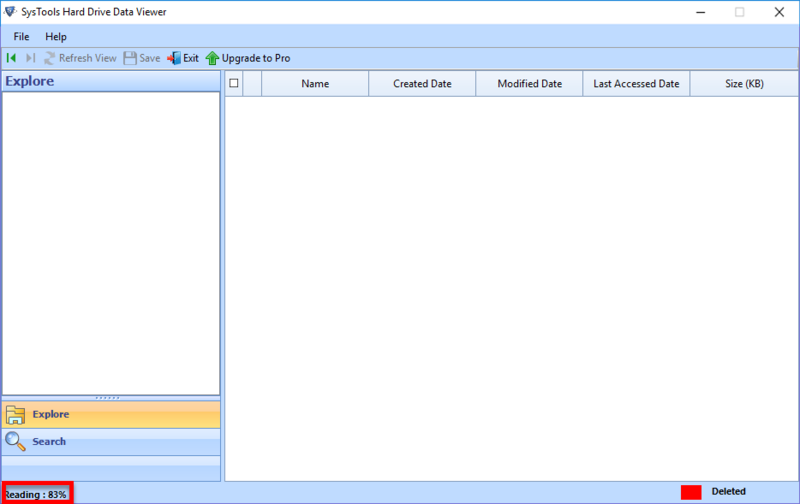 Free GPT partition viewer is having capability to retrieve permanently deleted files from the hard disk. Once the data is recovered, it will be highlighted with red color on the preview pane. 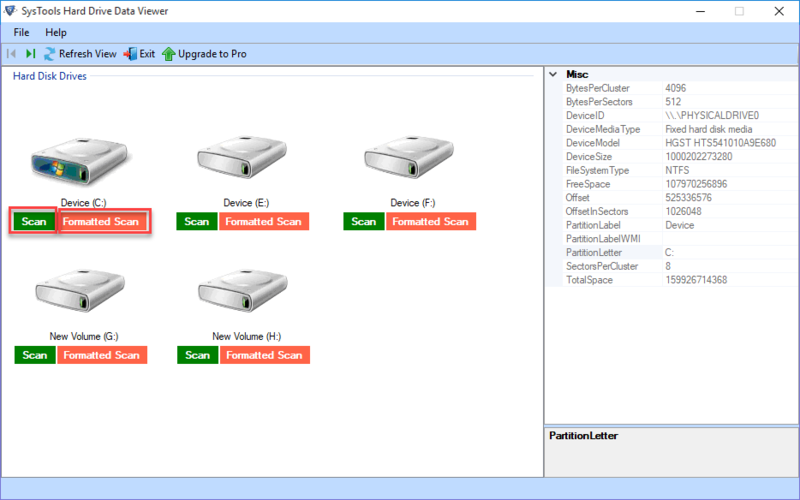 Hard Drive data Viewer is the smart freeware, which identifies all the partitions present on the system where software is installed. Users are only required to open the application on their machine and then, it will load internal as well as external disks. The freeware not only extracts data from internal storage device but, also from the external one. The external devices can be any like pen drive, memory card, hard disk, etc. The hard disk of any size can be previewed with this software without any hassle. Free Hard Drive Viewer only allows to view data file only. Is your software able to work on Linux Operating System? What will happen if I choose wrong hard dive in your tool and scanning had started? Is there any process to stop it? Yes, at the top left hand corner, there is a stop button. Click on it. A dialog box will appear for confirmation purpose. Click on yes, if you are sure to do this activity. If I want to save my data too, is it possible with your free version? No, in order to save your data, you can upgrade the freeware to pro by buying it. In freeware, you can only preview your data in form of a list. Is your software able to retrieve permanently deleted data too? Yes, if you have permanently deleted your data i.e., it is not present in your recycle bin then, you can view your data using hard drive data viewer. 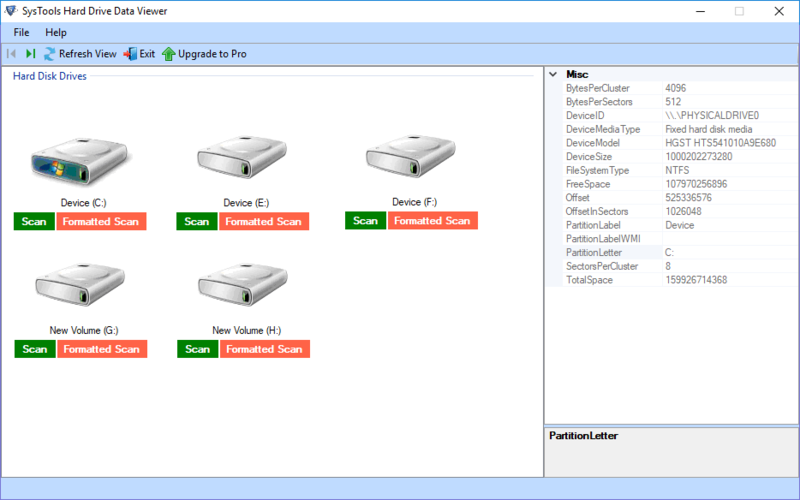 Will your tool work with external hard disks as well? Yes, this utility restores item from internal as well as external storage devices like pen drive, hard disk, memory card, etc. Before sometime, I was unable to view Hard Drive data. Though, I heard about many third party software but, I do not wanted to take any risk. Then, an engineer friend of mine told me about your Hard Drive Data Viewer. After his suggestion, I used this tool. This is very effective and speedy. I would recommend all my friends and relatives to use this software to view hard disk data. The best features of this software is that it is designed to recover permanently deleted data too. I have tried many software and I never get the desired results but, this one is amazing. Seriously, none can compete its consistency, accuracy, and speed. The facilities provided in this freeware are amazing and surprising because they require no cost to work with it. By mistake, I had deleted my important data. I wanted to recover it but, could not find any trustworthy solution. While surfing through the net, I came to know about your product i.e., Hard Drive data Viewer. All the features were according to my need. I used it and the results were great. Thanks to your software development team. This is an excellent software designed for both organization and personal use. The utility provides easy-to-use interface, which makes it possible for a beginner to work with it. Even size is also not any issue while using this tool. I think it is the most easy, efficient, and compatible tool to be used. Keep making products like this. Thank you!